iMobileTool SMS Backup offers a full SMS Messages backup solution to Backup all SMS messages for Windows Mobile Phones. 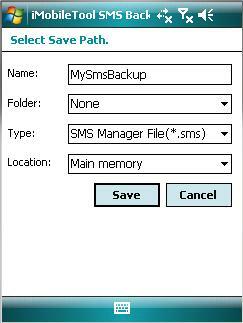 It can provide you: View and Manage Windows Mobile SMS on your computer; Restore SMS from the backup SMS file (.sms file); Support SMS messages editing. You can edit any of the sms messages you've backed up; Support English, Arabic, French, German, Chinese, etc SMS backup; Backup SMS messages to CSV File (.csv file). ...... save onto your pc. * Support all SMS default folders (Inbox, Outbox, Drafts, Deleted, Send) and custom folders. * Support English, Arabic, French, German, Chinese, etc SMS backup. * Backup SMS messages to CSV File(.csv file). * Support unlimited SMS backup/restore. * Print Windows Mobile SMS on computer. * Support SMS messages editing. You can edit any of the sms messages you've backed up, and restore them back to your mobile phone. * Export SMS messages into a txt file on computer. Qweas is providing links to iMobileTool SMS Backup 3.10 as a courtesy, and makes no representations regarding iMobileTool SMS Backup or any other applications or any information related thereto. Any questions, complaints or claims regarding this application iMobileTool SMS Backup 3.10 must be directed to the appropriate software vendor. You may click the publisher link of iMobileTool SMS Backup on the top of this page to get more details about the vendor.